One of the earliest funeral banquets ever to be discovered reveals a preplanned, carefully constructed event that reflects social changes at the beginning of the transition to agriculture in the Natufian period. Jerusalem, July 5, 2016 – The woman was laid on a bed of specially selected materials, including gazelle horn cores, fragments of chalk, fresh clay, limestone blocks and sediment. Tortoise shells were placed under and around her body, 86 in total. Sea shells, an eagle’s wing, a leopard’s pelvis, a forearm of a wild boar and even a human foot were placed on the body of the mysterious 1.5 meter-tall woman. Atop her body, a large stone was laid to seal the burial space. It was not an ordinary funeral, said the Hebrew University archaeologist who discovered the grave in a cave site on the bank of the Hilazon river in the western Galilee region of northern Israel back in 2008 (LINK to PNAS ). Three other grave pits have been found at the site of Hilazon Tachtit since 1995, and most contained bones of several humans. Nevertheless, the unusual objects found inside the grave, measuring approximately 0.70 m x 1.00 m x 0.45 m, point to the uniqueness of the event and the woman at its center. 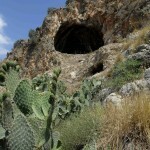 It began with the excavation of an oval grave pit in the cave floor. 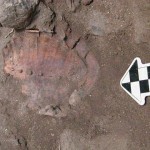 Next, a layer of objects was cached between large stones, including seashells, a broken basalt palette, red ochre, chalk, and several complete tortoise shells. These were covered by a layer of sediment containing ashes, and garbage composed of flint and animal bones. About halfway through the ritual, the woman was laid inside the pit in a child-bearing position, and special items including many more tortoise shells were placed on top of and around her. This was followed by another layer of filling and limestones of various sizes that were placed directly on the body. The ritual concluded with the sealing of the grave with a large, heavy stone. A wide range of activities took place in preparation for the funerary event. This included the collection of materials required for grave construction, and the capture and preparation of animals for the feast, particularly the 86 tortoises, which must have been time-consuming. “The significant pre-planning implies that there was a defined ‘to do’ list, and a working plan of ritual actions and their order,” said Prof. Grosman. The study of funerary ritual in the archaeological record becomes possible only after humans began to routinely bury their dead in archaeologically visible locations. The Natufian period (15,000-11,500 years ago) in the southern Levant marks an increase in the frequency and concentration of human burials. “The remnants of a ritual event at this site provide a rare opportunity to reconstruct the dynamics of ritual performance at a time when funerary ritual was becoming an increasingly important social mediator at a crucial juncture deep in human history,” the researchers said. 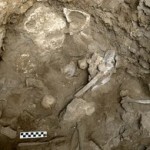 This unusual Late Natufian funerary event in Hilazon Tachtit Cave in northern Israel provides strong evidence for community engagement in ritual practice, and its analysis contributes to the growing picture of social complexity in the Natufian period as a predecessor for increasingly public ritual and social transformations in the early Neolithic period that follows. The unprecedented scale and extent of social change in the Natufian, especially in terms of ritual activities, make this period central to current debates regarding the origin and significance of social and ritual processes in the agricultural transition.